We are in our new house, at last. Well, sort of, anyway. 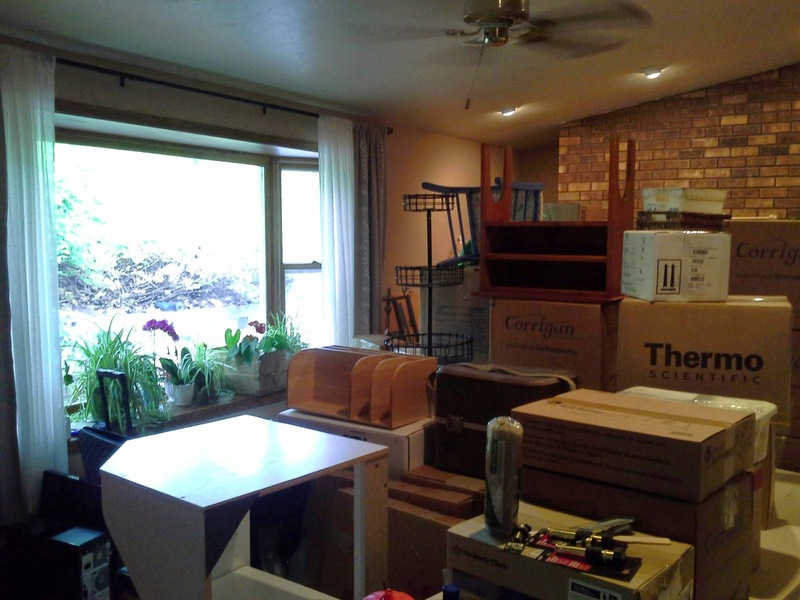 We are still surrounded by thousands of boxes, most of which are actually half full of packing paper, because that's how it's done. The kitchen is nearly unpacked, still looking for a few thing, but mostly we're operational. I am writing this from my tablet, and I haven't quite figured out how add in the pictures. We are still looking for all the parts to set up my computer. We have our first furniture arrangement in the livingroom, I'm certain we will be dancing the furniture around the room for some time to come. 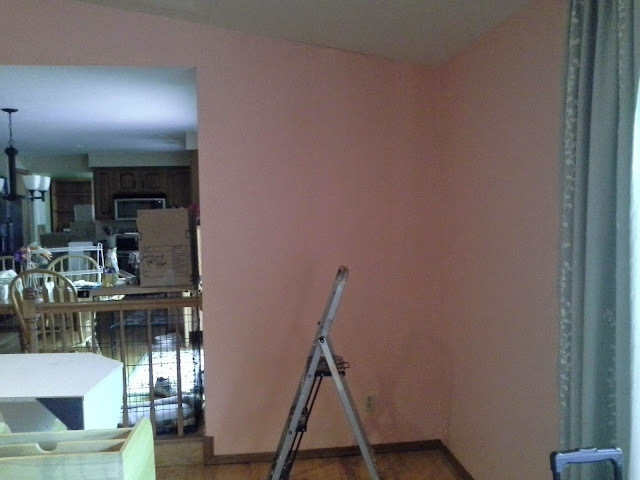 When the movers were delayed a day we high tailed it over to The Home Depot for paint to cover over the Hershey chocolate brown walls in the livingroom. Kent insists that the living room is the right place for the larger loom, so we're going to go with it. It's sort of our stand in for a grand piano. My studio is next on the list. It too is painted a dark sort of brown. I am not a fan of brown. I get to use the family room as my creative space, once again. I know I'm going to love the fireplace come winter, and all of the gorgeous afternoon light will be wonderful. In setting up the new house I am suffering from a tragic case of but first disease. For example, I'd love to move into the studio, but first we need to paint the walls, because we all know once those shelves are full they are never going to be moved again. 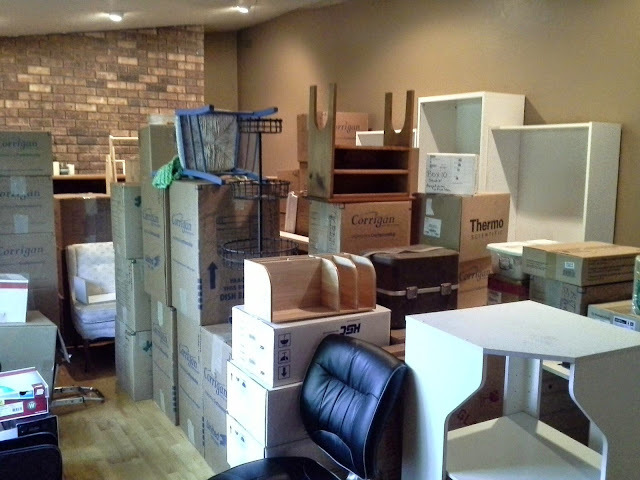 I need to unpack the kitchen, but first I need to figure out where everything goes. Kent reminded me of how much I like organizing things, and just think about how much fun I'll have reorganizing thing as I learn how these rooms work! The last photo is the cube wall, where all the Art Bin cubes will be stacked up. The color is Blushing Apricot from Home Depot (200A-3). I used this color in my office/loom room in the Saginaw house and we both loved how it just glowed. It's a cheerful color that brings warmth and light to a space. It's going to be terrific with white cabinets against it.